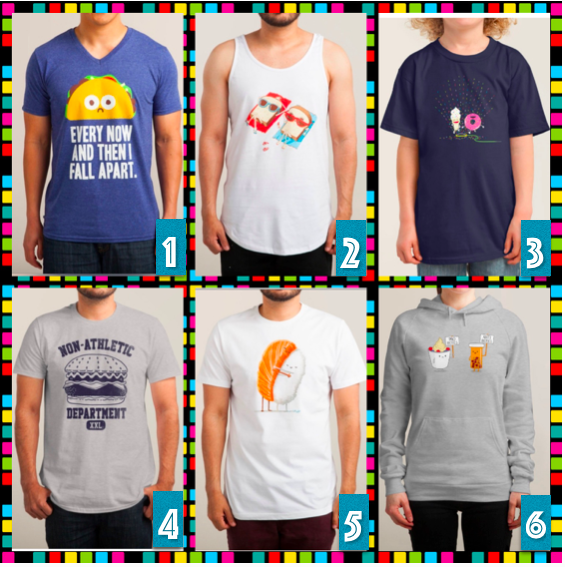 The other night, while insomniatingly (made up word) perusing the internet, I stumbled upon Threadless, a site I had learned about years ago that I stored in my “remember every five years” file. Threadless boasts a variety of digs and wall art, and everything on the site is created by independent artists. Their shtick is to make unknown artists become totally known artists, and I can see why that would work for many of these designs. Of course, my natural inclination was to search the food themed garb, and I was pleasantly surprised to find lots of food sarcasm. My six favorite selections are below. Look for me sporting number 1 sometime next week.